So who owns Crimea? Depends who you talk to – but careful with the maps! The question of who is the rightful owner of Crimea is continuing to drive some companies and the international community into a stupor: how to portray this territory without offending anyone? RBTH has collected a number of colorful incidents that have recently taken place involving maps of the disputed peninsula. In late January, Coca-Cola and PepsiCo found themselves at the center of a scandal after designating Crimea as part of Russia on their social network pages. The peninsula was featured in a map of Russia posted by Coca-Cola Russia ahead of New Year. Its competitor – the Russian branch of PepsiCo – followed suit by designating Crimea as Russian in an online brochure. Ukraine's reaction was swift – the prosecutor's office launched a criminal investigation against the company's employees for the public recognition of the illegal annexation, as well as abuse of power. However, seeking to avoid a conflict with the Ukrainian authorities, the corporation's central office immediately apologized and blamed a marketing agency that was in charge of developing the map. PepsiCo offered no explanation for the appearance of Crimea on the map at all, but simply removed the scandalous image. Another Crimea-related dispute took place between the press secretary of the U.S. Embassy in Moscow, Will Stevens, and the press secretary of the Russian Embassy in Washington, Yury Melnikov. The diplomatic argument, which featured sarcastic comments and personal attacks, erupted on Twitter, and all because of a 1951 cover of the American magazine Collier. It depicts a hypothetical map of Europe (what would happen in the case of World War III), in which Crimea and Ukraine are occupied by the Nazis, and are marked, accordingly, with one color. The pseudo-map was posted by the spokeswoman for the Russian Foreign Ministry, Maria Zakharova, to illustrate a completely different point – the expansion of NATO to Russia's borders. Which was fine, until her tweet was spotted by Mr. Stevenson. "Our colleagues @MID_RF have recognized the illegality of the attempted annexation of Crimea & returned it to Ukraine," wrote Stevenson, which caused a reaction from Melnikov. "Seriously?! It's the cover of Collier's on Oct 27, 1951. Map still inaccurate, but shows the attitude," he wrote. However, Stevenson continued to insist on Crimea's historical connection to Ukraine, pointing out that this map was from 1951. "Maybe they didn't teach you Soviet history in school? 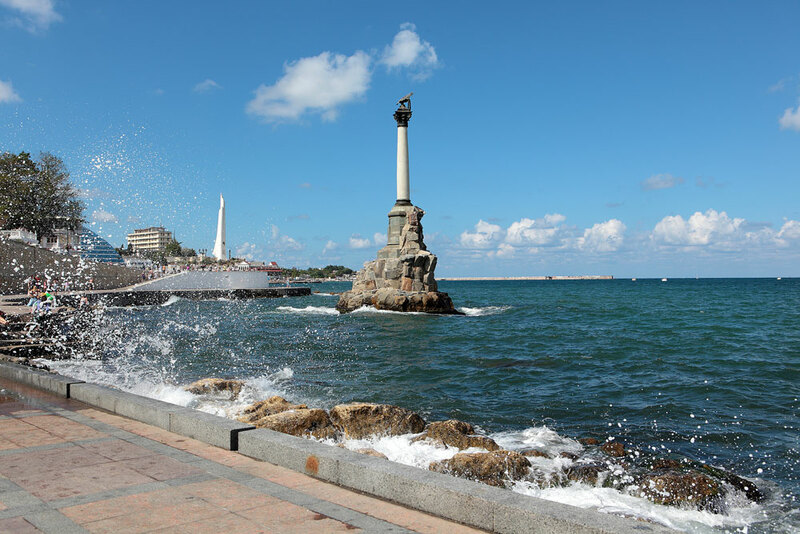 – 1954 – Supreme Soviet returns Crimea to Ukraine," he said, backing up his knowledge of Soviet history with a newspaper clipping featuring a report on the 1954 decree. But, of course, it was about the transfer, rather than the return of Crimea, as the peninsula was part of Russia from 1784 all the way until 1954. The American diplomat got a little confused with the verbs, which was pointed out by his Russian counterpart: "Transfer, not return. Even Google Translate gets it," said Melnikov. For the most striking misunderstanding look no further than American TV channel CNN, which did not just include Crimea as part of Russia on air, but attached the entire territory of Ukraine to the Russian Federation. The map, which appeared on the screen, showed a single state, with the Russian flag flying proudly over it – perhaps for the purpose of clarity – while news anchor John Vause maintained his equanimity, repeatedly referring to the mishap behind him. The news, as it happened, was about the situation in Ukraine, which again gave the Western viewer food for thought about the Russian intervention. But the Russian search engine Yandex proved the most cunning and decided from the outset that Crimea would be displayed depending on where the user lives and on the official position of this country. On its Ukrainian website, Crimea is shown as part of Ukraine, and is included in Russia on its Russian website. In order not to offend any of its clients, the IT company has even allowed users to draw state borders themselves using Yandex Maps API, and post these maps on their websites. Similarly, Google Inc. decided to separate Crimea, attach it or use broken lines to delineate the territory, as in the case of Abkhazia, depending on the country. Meanwhile, the U.S. National Geographic Society providently stated that changes in its maps do not suggest recognition of Crimea's status, but only reflect the situation in the world. “We map de facto, in other words we map the world as it is, not as people would like it to be,” said National Geographic’s geographer Juan José Valdés. Natalya Pukhova contributed to this report.